Wet spring weather has provided an excellent environment for mushrooms. They can form wherever sufficient moisture and organic matter is present. 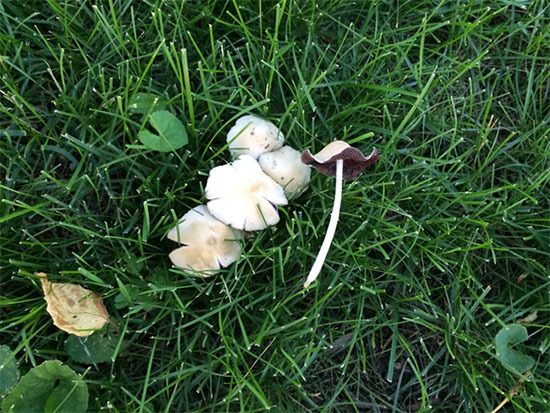 When found growing in turf, mushrooms tend to stand out and be unsightly to some. The fungi responsible for producing the mushrooms live off organic matter in the soil, such as decaying tree roots or buried construction debris. The fungi are not harmful to lawns, and the mushrooms will eventually disappear on their own. However, they can be picked, raked or mowed off to speed up the process. Mushrooms can form in distinct circles or arcs in turf with diameters ranging from a few inches to 50 feet or more in diameter. These circles can reappear from year to year as the fungi expand radially below ground. 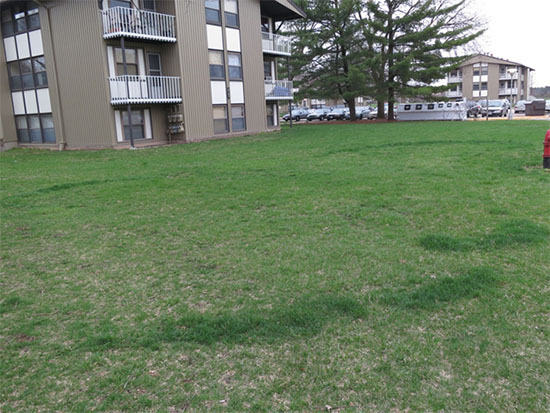 These circles are referred to as "fairy rings," a name obtained from old folklore that theorized the rings to be areas where elves, pixies, or fairies danced and played. Fairy ring fungi free nitrogen as they break-down organic matter, essentially fertilizing the turf. This can result in distinctive circles or arcs of lush dark green growth. Fertilizing will help mask the symptoms by promoting lush green growth of the turf surrounding the ring. The fairy ring will essentially blend in with the fertilized turf. Lush, dark green, early spring turf growth associated with fairy ring fungi. Some fairy rings are associated with areas of brown, dead or dormant grass. The dead or dormant grass is likely caused by the dense subsurface layer of fungal growth that creates a hydrophobic soil condition and impedes water movement in to the turf. Some other theories suggest the subsurface fungal growth depletes nutrients essential for plant growth, and may even produce toxic levels of ammonia or hydrogen cyanide that kill the grass. Areas of killed turf are difficult to re-establish and are often invaded by weeds. Fungicide applications have provided mixed results in suppressing fairy ring development. The fungicides need to be applied with a soil surfactant at a time when the fungus is actively growing. Symptoms can be "masked" by deep watering. Core aerification and the use of wetting agents will help the water move deeper into the soil.